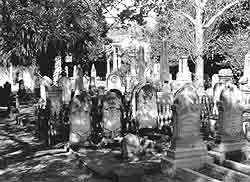 The Coming Street Cemetery, established in Charleston, SC in 1762, is the oldest Jewish burial ground in the South. Privately owned by Kahal Kadosh Beth Elohim Synagogue, the cemetery contains some 600 marble and brownstone grave markers. Most of the markers date to the last half of the 18th century or the first half of the 19th century, and include box tombs, table-top tombs, obelisks, and columns. Many are significant examples of gravestone art, signed by locally prominent sculptors and stonecutters. Significant artistic markers denote the graves of prominent Charlestonians such as Joshua Lazarus (1791-1861), former president of the Beth Elohim Synagogue and the Charleston Gas Light Company. Lazarus's marker features a fluted column on a pedestal, surmounted by an urn. Marx E. Cohen, Jr. (1839-1865) was a Confederate soldier killed near the end of the Civil War, and his obelisk marker features a cannon below the State and Confederate flags in bas-relief. An elaborately detailed box tomb, described as a "stone canopy," memorializes Catherine Lopez (1814-1843), wife of David Lopez, builder of the Beth Elohim Synagogue. Lopez is buried in a family plot of land adjacent to the main cemetery that was later incorporated. At the time of her death, she was not permitted burial in the main cemetery because she had not converted to Judaism. A stuccoed brick wall surrounds the Cemetery, portions of which are original. An important feature of the site, this brick wall has been a major factor in preserving the intact cemetery over the past two centuries. There are also remains of a wall that once divided the cemetery, reflecting a time in the mid-19th century when the Beth Elohim congregation was divided over a doctrinal dispute. By 1887, Beth Elohim established a new cemetery, and burials in the Coming Street Cemetery are now restricted to the few vacancies in the adjacent family plots. The appearance of the cemetery, or graveyard as it was called historically, has been little altered. Over time, some damage has occurred to individual gravestones from pollution, climate, severe weather and vandalism. Coming Street Cemetery is located at 189 Coming Street. It is a private burial ground and not open to the public.